Democratic and Republican lawmakers, business and LGBT advocacy groups held dueling press conferences Tuesday as the struggle continues over a compromise to repeal the controversial House Bill 2. The press events came as pressure mounts to prevent the loss of a number of highly lucrative sporting events – including six years of NCAA championships – due to the law. A number of repeal bills have been filed, but none seem to have broad bi-partisan support. Last week Republican and Democratic state representatives filed House Bill 186, touted by its sponsors as a compromise bill. The day began with a morning event at which LGBT advocacy group Equality North Carolina brought together Democratic lawmakers, Triangle area business owners and parents of transgender children to express their opposition to the bill. 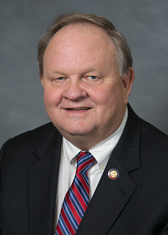 Rep. Chuck McGrady (R-Henderson) headlined a press conference later in the day that brought together Democratic and Republican lawmakers, business leaders and trade group associations and even two Democratic members of the Charlotte City Council. McGrady said the Republican votes don’t exist to pass a repeal without the referendum provision. About 35 Republican and 35 Democratic votes are needed for HB186 to pass, McGrady said – and he called on Gov. Cooper to help him rally the votes. Rep. Chuck McGrady, R-Henderson, is a primary sponsor of HB186. The referendum provision would assure that “once we get out of the bathroom business, we stay out of the bathroom business” Grady said – while allowing communities that can get a referendum passed to expand further protections to LGBT people. McGrady said he would not “draw any lines in the sand” but did not see how a compromise bill could pass without a repeal of HB2 to appease Democrats and a referendum provision to appease Republicans. He called for further dialogue and welcomed anyone to tell him how it may be done. Sadie Weiner, Cooper’s communications director, disputed that in a statement Tuesday. Representatives from the North Carolina and Charlotte Chambers of Commerce, the North Carolina Realtor Association were among a number of business representatives on hand to encourage a compromise solution. Most were careful to point out they weren’t endorsing HB186 or its specifics but said they were encouraged by the dialogue it has brought about and called for a swift solution. Charlotte City Councilman James Mitchell was one of a few Democrats on hand for the press event, though none of them spoke as extensively as GOP lawmakers. Mitchell praised lawmakers for the dialogue that is occurring and encouraged a compromise. After the event, Mitchell said that while some repeal of HB2 is essential to save jobs and tourism dollars now being lost, he does not support the referendum provision of HB186. “I do think the referendum is going to cause some headaches for municipalities,” Mitchell said, calling it “a deal-breaker” for him. Rep. Darren Jackson (R-Wake), the House Minority Leader, held his own press conference Tuesday afternoon. He said neither he nor Cooper have walked away from the negotiating table – but there are some things they don’t feel are negotiable. Rep. Darren Jackson (D-Wake) demonstrates that the votes don’t exist to pass HB2 repeal with a referendum provision. Jackson refuted McGrady’s claim, made Monday night, that Democratic lawmakers had been threatened if they signed on to the bill. After a Democratic caucus meeting Monday night, he said, it was clear the Democratic votes simply don’t exist to pass a repeal with the referendum provision. 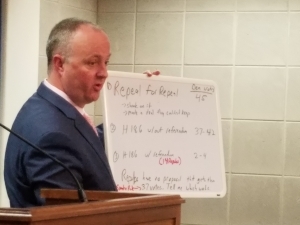 He illustrated the point using a white board on which he had written vote totals for various repeal scenarios. The few Democratic lawmakers who had signed on as sponsors to HB186 had done so because they wanted to keep the conversation going and were under the impression that a referendum was negotiable and could come out later, Jackson said. Rep. Marvin Lucas (D-Cumberland), one of the bill’s few remaining Democratic sponsors, confirmed that. Lucas said the referendum provision would personally be a deal breaker for him – and he believed it would for most of his Democratic colleagues as well. Lucas said he made that known when signing on and his Republican colleagues understood it. Though he said he had not spoken to N.C. House Speaker Tim Moore (R-Cleveland) about HB2 since December, Jackson said he has from Republican colleagues that N.C. House Speaker Tim Moore (R-Cleveland) is unwilling to negotiate on the referendum provision. The original deal on HB2 repeal floated in December was a straight, unequivocal repeal of HB2 for the straight, unequivocal repeal of the ordinance passed by the Charlotte City Council, Jackson said. That had enough support to pass, but it turned out there weren’t enough votes in the Republican caucus to actually get it done. With sports organizations meeting this month and next to decide the location of championship games, the window for a compromise may be closing. Jackson said the state may be able to save some major basketball tournaments if a deal can be reached by mid-March . But that’s going to require a deal between Republican legislative leadership and the governor, Jackson said – and one that is palatable to both sides.